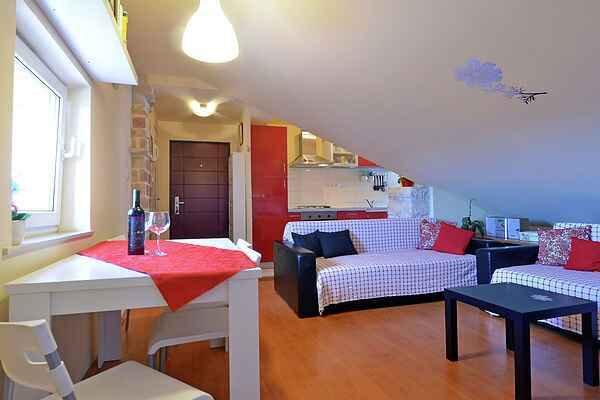 Our charming attic apartment is located at the quiet part of the city center in Zadarska street. The apartment is situated near most of the historical monuments and attractions of Pula, such as: the Amphitheatre, Portaurea (Arch of the Sergeius' Family – also known as the Golden gate), then there is the Double Gate (or the Gate of Hercules) and the city walls, Augustus temple, the Roman Forum, the Roman theatre, the Cathedral of Assumption of the Blessed Virgin Mary, the Franciscan Monastery, the bastion fort on the „Castle“ hill, Sergeius street etc... Also, only a short walk away you will find the open air vegetable market and fish market. Where you can buy fresh produce daily. While in town have drink at the „Giardini“ square, perfect to just sit and relax under in the shade provided by their canopies, especially on a hot summer day or evening. The the loft apartment is composed of 1 bedroom with a double bed (180 x 200 cm), and other bedroom with a single bed (90 x 200 cm) and 1 dinningroom with 2 sofa beds, which can extend into comfortable spare beds (160 x 200 cm). The Apartment has a dining corner and fully equipped kitchen with utilities, fridge, toaster and and italian moccha coffee maker . The bathroom has a shower . Sleeps : up to 5. We provide sheets and towels. We have a non-smoking policy. There are public parking space on the other side of the building. The closest ATM is in the center, 1-2 minutes from the apartment, grocery shops as well. The city center is very well connected to the other parts of the city by local public buses. If you want to spend a week exploring the of highlights Pula or enjoy a short entertaining 3 days break in the city center, don't hesitate to book with us.